You Too Can Be a Peeping Tom. This isn't a celebrity endorsement, but it's a tie-in to the Hitchcock classic "Rear Window." In the movie, Stewart is layed up with his leg in a cast; he uses his Exakta VX with a long lens to spy on one of his neighbors whom he thinks is a killer. In the movie they put a piece of tape over the Exakta badge so you couldn't read it, but Exaktas of that era have unique styling and they're easily identified. 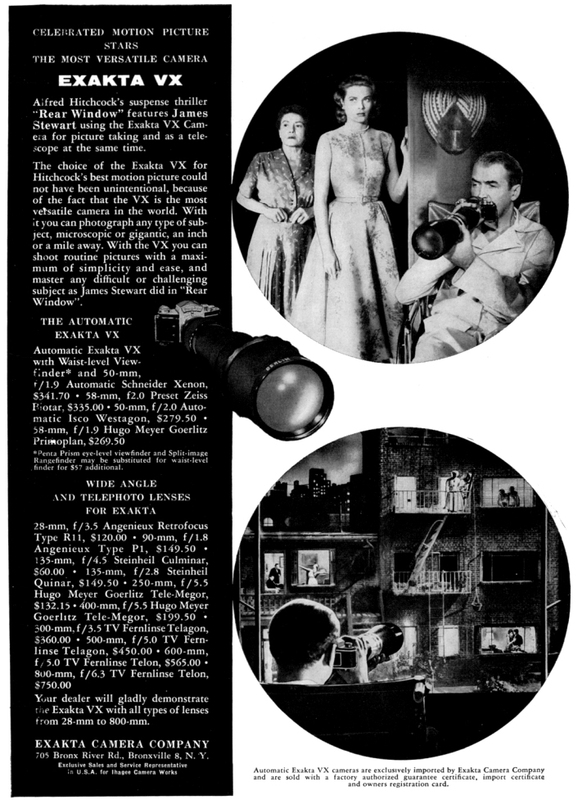 This is somewhat related to Doris Day's Bolex ad, which ties in to another Hitchcock film, "The Man Who Knew Too Much."